A stable and artist studio built for C. Ledyard Blair and designed by Trowbridge & Livingston c. 1900 at 121 East 63rd Street in New York City. At the time Blair was living at 15 East 60th Street. Today the building is the Gurdjieff Foundation, click HERE to see the building on google street view. Click HERE for more on Blair's country estate 'Blairsden'. 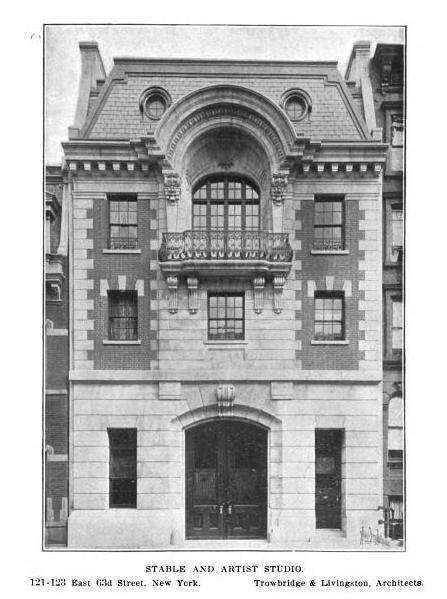 Photo from Architectural Record, 1901. I have passed here many times and wondered about the original central doors. What a treat to finally know. One of the best. I think it's the best left.